Brought to us by the team who produced Florence and the Uffizi Gallery and Caravaggio: The Soul and The Blood this is a journey through the life and times of Claude Monet ( 1840-1926) the obsessive Impressionist . An art-world disruptor at the turn of the 20th century whose obsession with capturing light and water broke all convention, Monet revolutionised Modern Art with his timeless masterpieces. His intention was to try and transfer onto canvas the “first, pure impression” of forms and objects as they appear to the eye as if they have never been seen before. Monet was always trying to capture in paint Water,Light and Air. He lived most of his life near the River Seine . Like Turner and Constable ( for example) he painted in all kinds of weather. 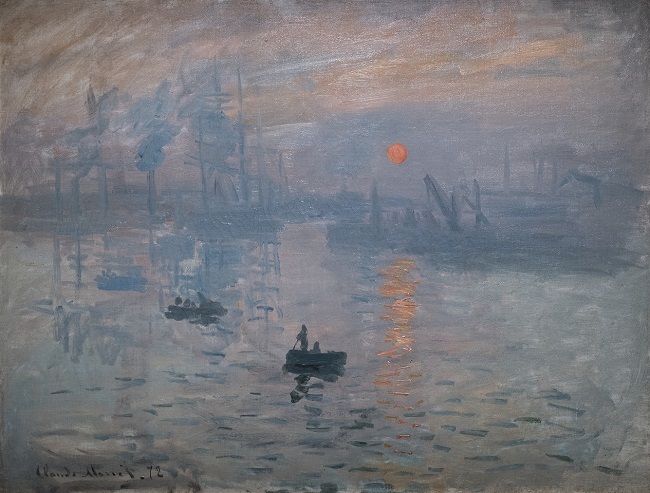 The term ‘ Impressionism ‘ comes from the title of his 1874 work Impression Sunrise included in the first of the independent exhibitions mounted by Monet and his colleagues as an alternative to the Paris Salon. In his famous gardens at Giverny (where he lived from 1883) he set himself the challenge to create the nature he wanted to paint, creating the striking way the garden was designed and the way the plants were organised in the garden, for example. The film briefly looks at his life before 1883, with Monet’s stays in London, the Netherlands and Paris in particular mentioned. Also the effect of the Franco-Prussian war of the 1870’s . We also learn of his marriage to Camille Doncieux , his first wife, and her eventual tragic early death . The film also examines Monet’s reaction to World War 1 and his friendship with statesman George Clemenceau. There is some fascinating grainy black and white footage of Monet painting and we see him with Clemenceau. Also there is footage of the horrors of trench warfare etc of WW1.Some stunning contemporary footage of the gardens at Giverny are included and we see the huge team of gardeners at work. And of course much is made of the famous bridge and the waterlilies. Most of the last part of the film examines Monet’s reaction to the death of his second wife Alice and his son. 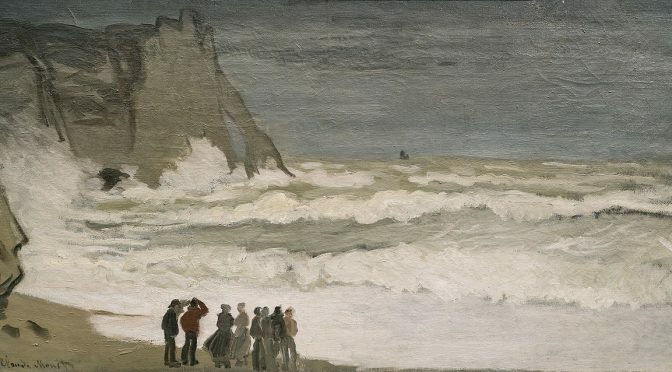 We also learn how in his last years Monet had terrible eyesight problems yet overcame them to produce some huge extraordinary works that enthral. Unfortunately I found it a bit disappointing. It mostly moves at a slow, ponderous pace and our ‘guide’ ( Elisa Lasowski star of Game of Thrones ) , often shown drifting down the River Seine on a barge, is sometimes rather wooden in presentation . Curators of the various museums and other experts also have their say including Ross King , author of Mad Enchantment : Claude Monet and the painting of the Water Lilies . While yes the film examines Monet’s life and work, and places him in historical context , and yes there are some stunning sections of photography of the gardens at Giverny , and yes we see various works at the Orangerie Museum, the Marmottan Museum and the Orsay Museum , some of the photography – especially some of the aerial shots – were taken at a dizzying pace that almost makes you ill. Also there is an over-dependence on fancy photographic effects ( kaleidoscope like reflections , mirroring , underwater work) for example. When we are shown the various exhibitions at the Museums it is blink- and- you- miss- it very quick tours. And none of Monet’s works as shown are named and dated, unlike the way works were presented in the previous films. An interesting , sometimes visually stunning film but a trifle disappointing . Water Lilies by Monet – the Magic of Water and Light screens at selected cinemas from March 23 2019.